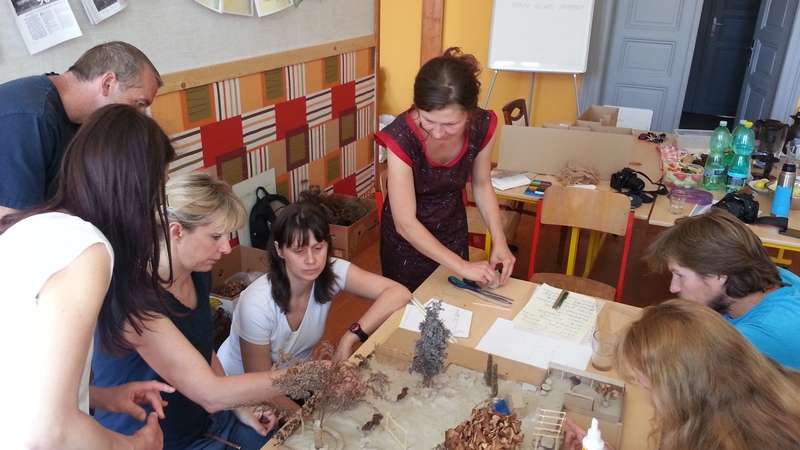 Joint construction of the school garden model with the participation of parents and teachers. 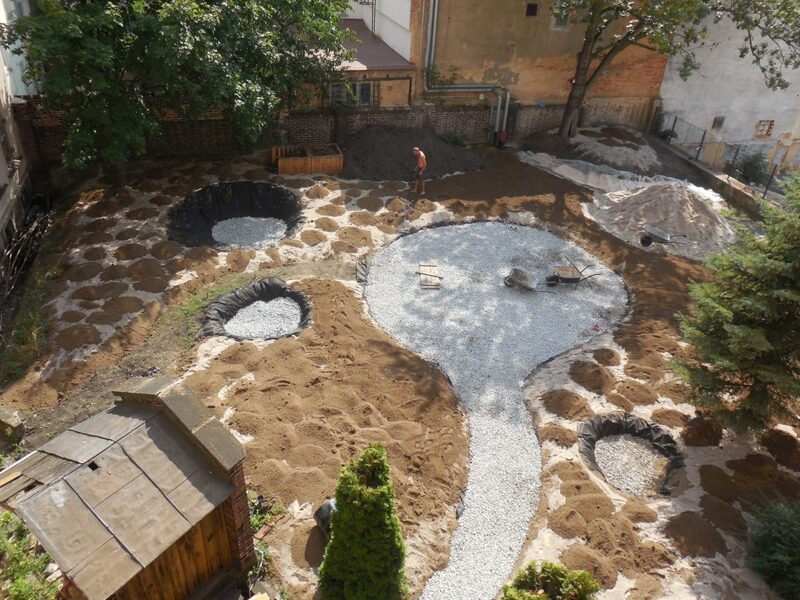 The aim is to create a mysterious garden full of playing corners. 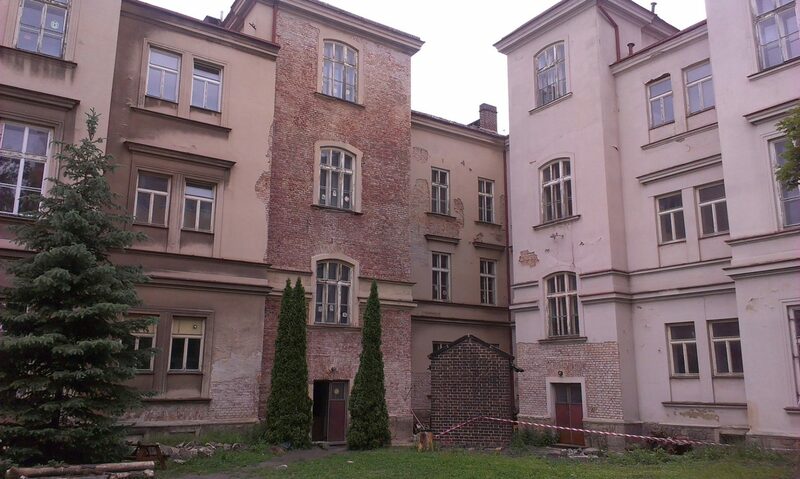 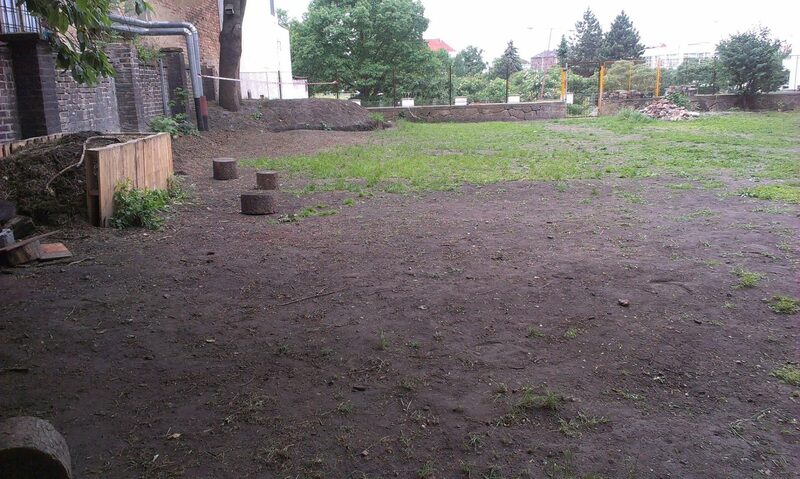 The school yard, will also include space for schooling. 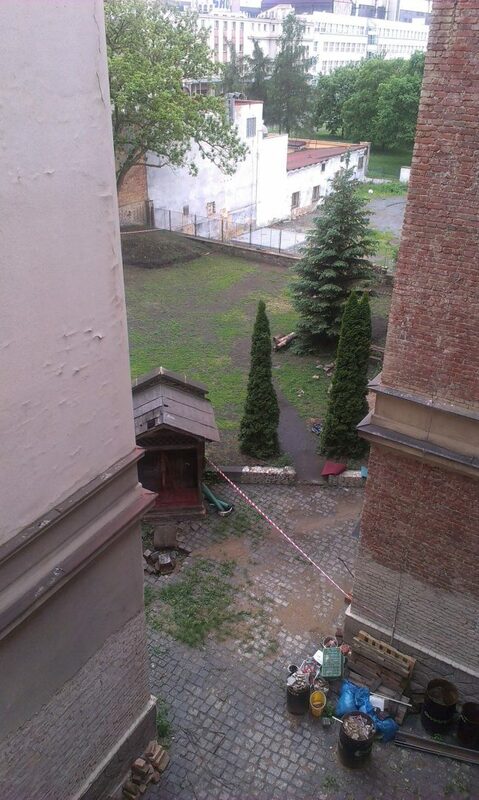 In the courtyard, there is a small gazebo to be reconstructed, which covers a well. 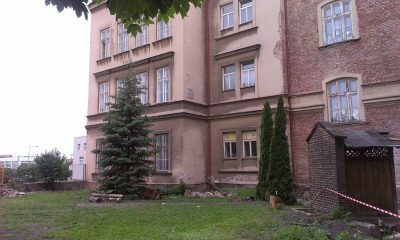 Architectural study. 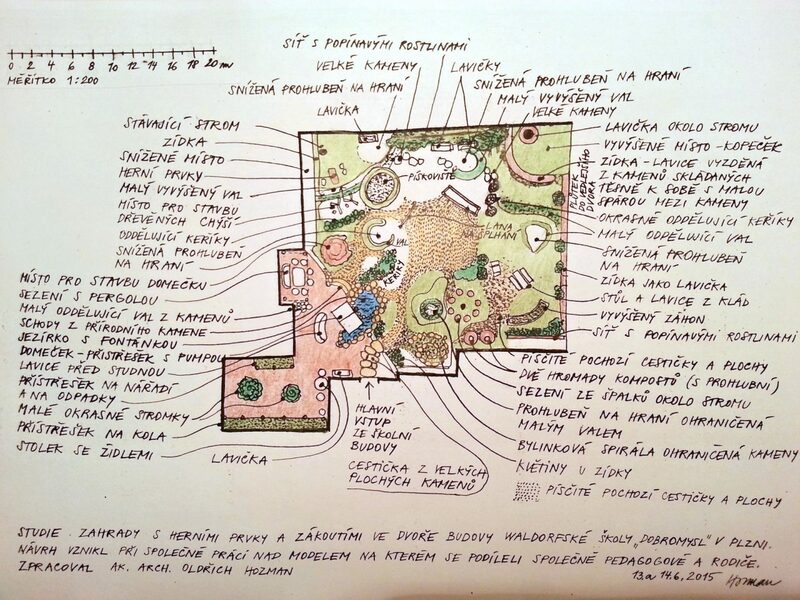 Ground plan of the "Dobromysl" Waldorf school in Pilsen. 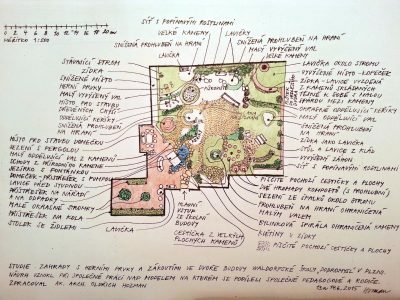 It is important to involve as many future users as possible in the design creation. 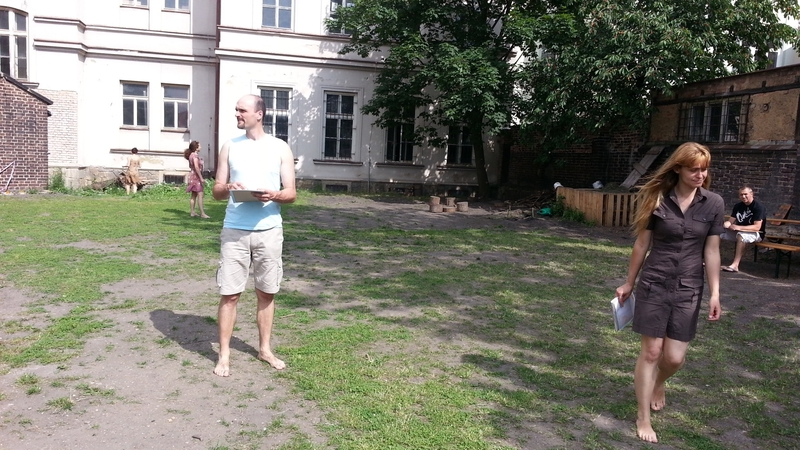 In this case these users involved teachers and parents. 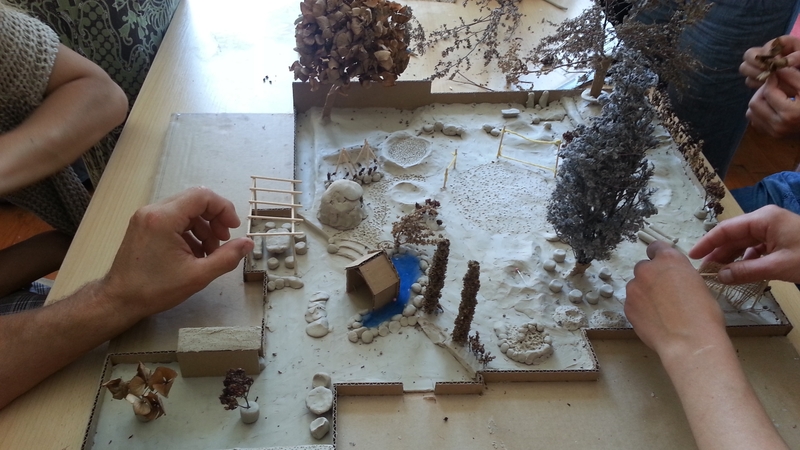 Based on the consideration of what could be in the yard, we began to create a model of the garden. The method of joint work allows bringing not only the strengths of thinking, but also the strengths of feelings and will into the design process. 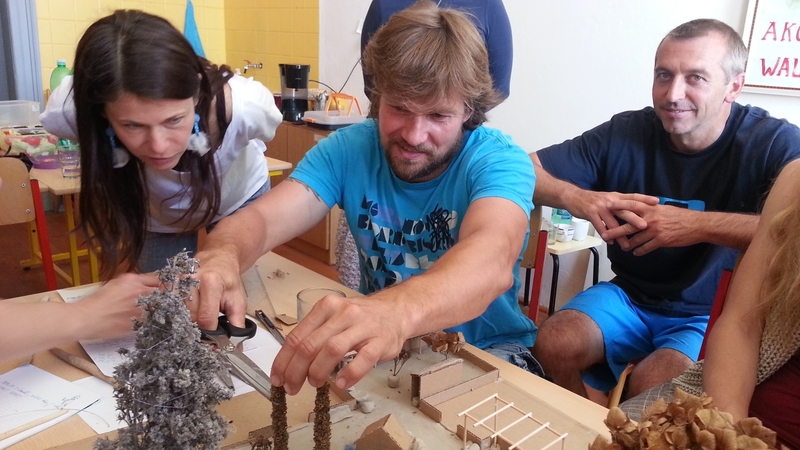 Every participating person brings liveliness and joy into the process of creating the model. 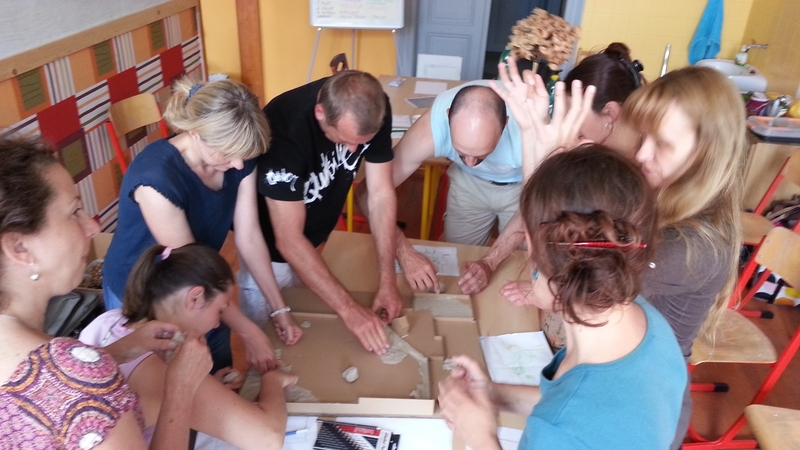 Working with plasticine during the modelling creates the atmosphere of joy and creativity. It helps to feel the context and build on the work of others. 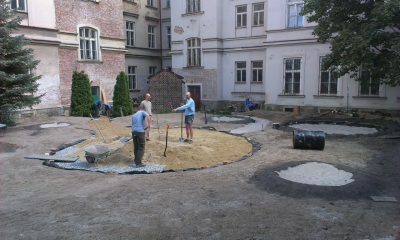 This is how mutual agreement on the formation of the garden is created. All participants are able to mentally connect with the emerging proposal in a better way. 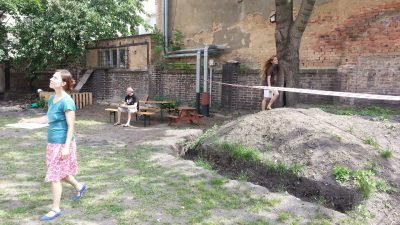 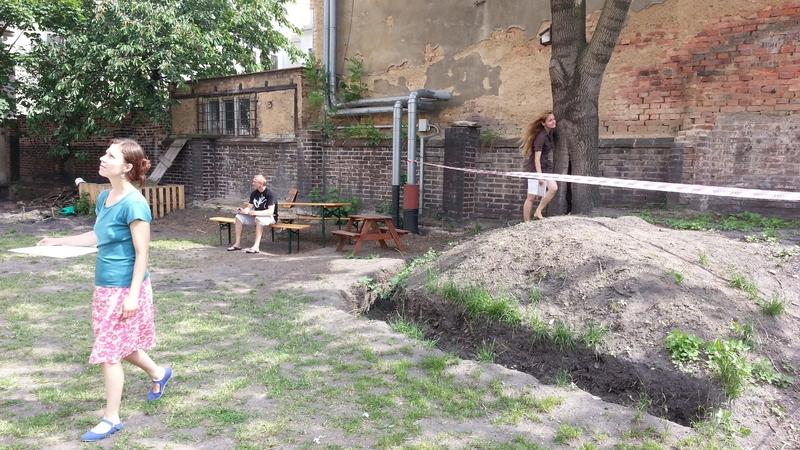 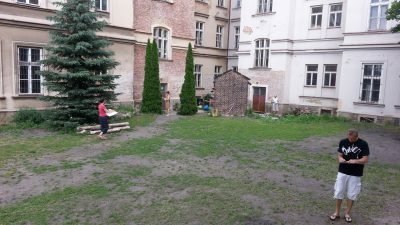 A model of a playground and a garden created at a joint workshop with teachers and parents on 13th and 14th June 2015 at Dobromysl Waldorf School in Pilsen. Implementation of the garden according to the study and the model created at the joint workshop. 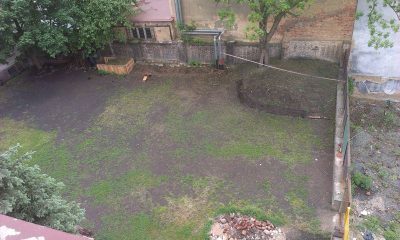 A common artwork on the model of the garden according to which a study and the subsequent implementation were carried out. 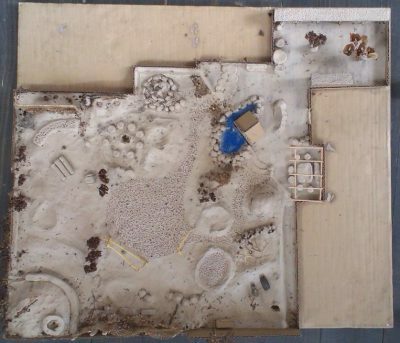 Joint creative work on garden model. 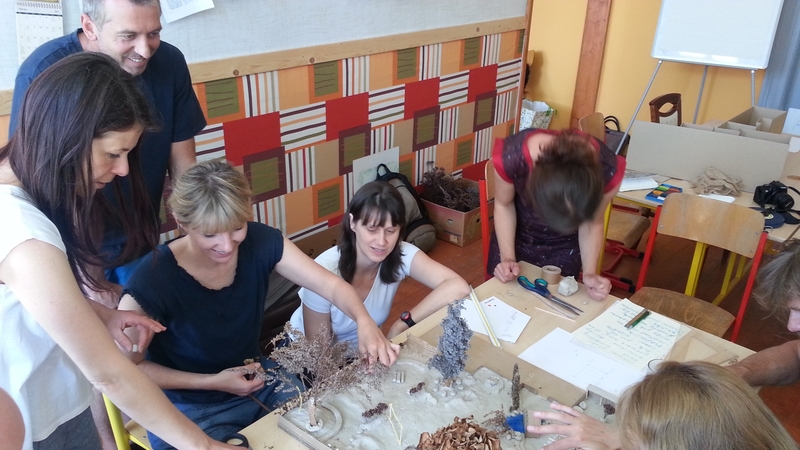 The workshop was attended by pedagogues and parents of children from Waldorf School. Joint creative work on garden model. 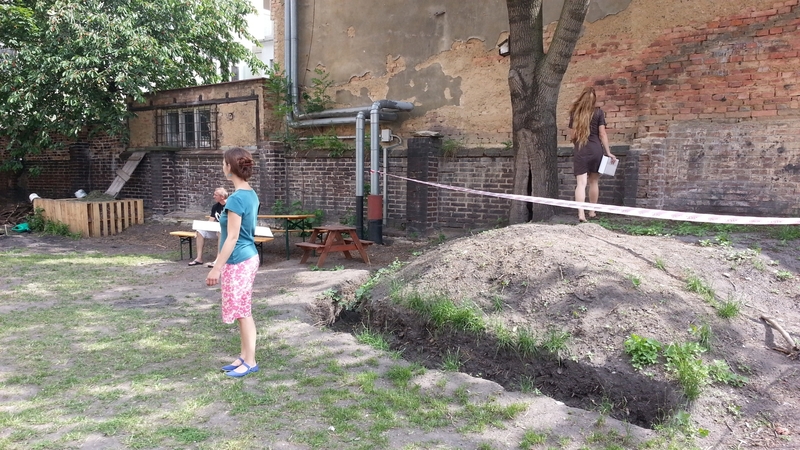 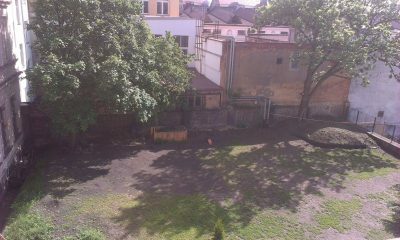 Perception of the existing schoolyard space. Perceiving sensory boundaries of the individual nooks. Perception of the existing schoolyard space. 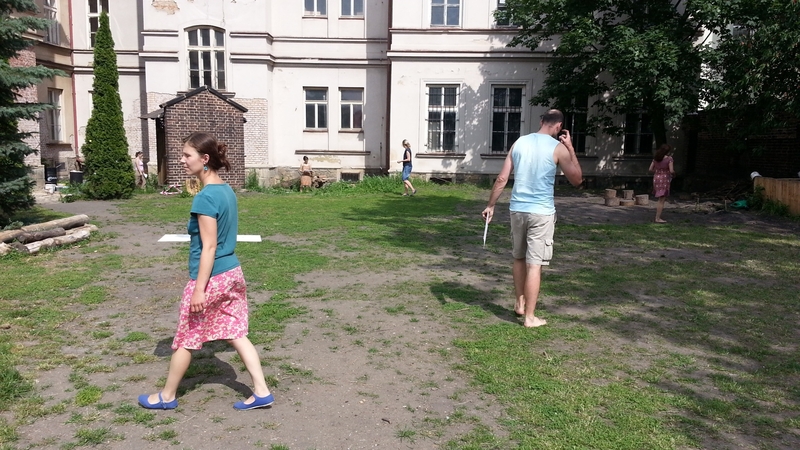 Perceiving sensory boundaries of the individual nooks. Drawing sensory boundaries into the layout.